Data, data, data! When most people think of teachers, they don't think of data. 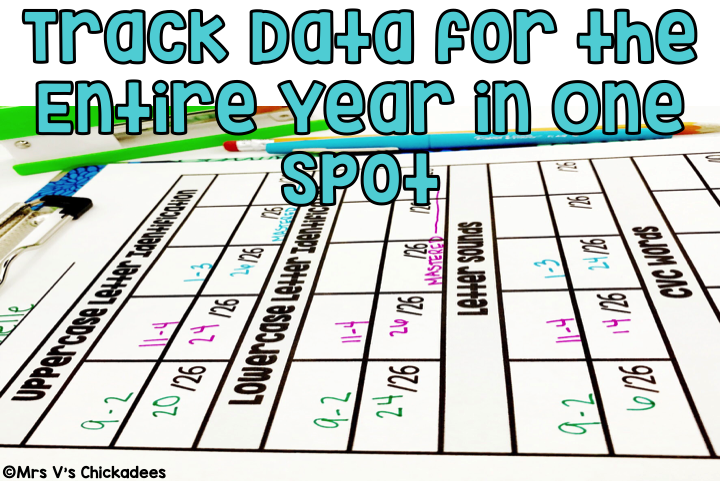 Yet, the reality is, we are overwhelmed with data throughout the year. When gathered properly, and used correctly, data is SO SO IMPORTANT. However, a lot of times, we don't even know where to begin. That is why I created the baseline assessments for multiple grades. When I first started teaching Kindergarten I had no idea where to start. Some kiddies didn't know if they were a lefty or a righty, and others were writing their own names independently. Rather then waiting to find this information out the hard way (and wasting valuable time that could be spent targeting specific needs), I decided to carve out a chunk of time to assess each and every student individually. During this time I was able to not only get to know them and begin building a relationship with them, but I gathered information that I used to drive all instruction moving forward. You see, the baseline assessment assesses key grade level skills. Plus, there is a tracker to take notes on everything. So after completing the assessment, I know who belongs in my high, middle, and low groups. I know who to red flag for possible RTI, who gets frustrated easily, who is showing signs of independence, who seems to have a speech delay, etc, etc, etc. It is so eye opening! Now that my math and ELA groups are made, I start tweaking pre planned lessons to target the skills this group of kiddies needs, I start differentiating and modifying work for certain students. It really is a critical piece of my teaching. Now here is my favorite part. The tracker that I record all of the data on in the beginning of the year, is the same tracker I will use until they are ready to go to the next grade. I will keep ALL of their information on that one piece of paper! By doing this, I can easily look at it and see what areas are their strengths and what areas are their weaknesses. 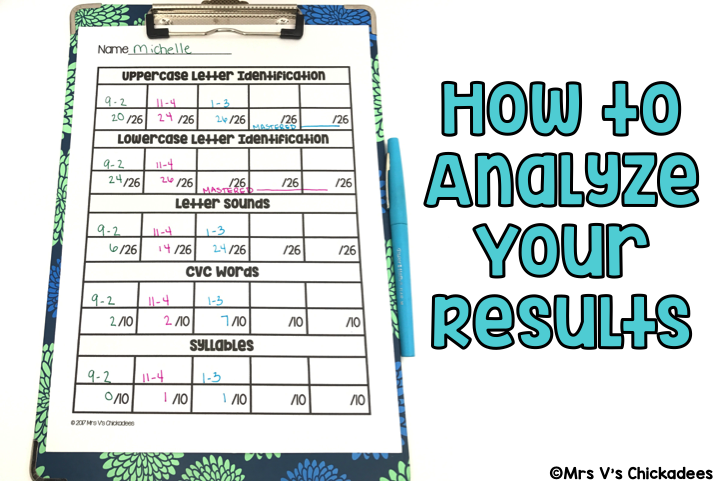 When it is time to write report cards, I pull out the tracker and BOOM-all of the information I need is right there...and I mean specific information. I'm not saying "Johnny knows most of his letter sounds" I am saying "Johnny is showing progress in his letter sounds. He now knows 24 out of 26 sounds (he is struggling with /q/ and /m/), which is 10 more letter sounds than he knew last marking period." I mean doesn't that sound like a teacher that knows what she's doing? (wink, wink). This is also used to drive parent-teacher conference conversations, and really go in depth on key skills with parents. Whether you are a general education teacher, co-teacher, special education teacher or interventionist, this baseline is for you! So as a general education teacher it can be really challenging to remember your special education students IEP goals, especially since you're also trying to remember that Mary isn't taking the bus today, Peter can't sit at the peanut table at lunch, Joey needs an extra copy of the homework, and the 9 million other things that are swirling in your brains on a daily basis. BUT, that doesn't mean it's not important, it is SO important. So what I would do is, find the skills in my baseline that were connected to my special education students goals and highlight them on their tracker. That way I could check periodically, refresh my memory, and see where they stood with it. Constantly touching base with myself and holding myself accountable for targeting those goals in the classroom. Also, when it came time to write those dreaded IEP reports, I would use the data from the baseline assessment to give very specific information about their progress in the classroom. I was always told that I wrote such detailed reports and no other teachers did that, and the reality is, my reports took very little time to write because I was simply taking the data from my tracker and putting it into sentences. 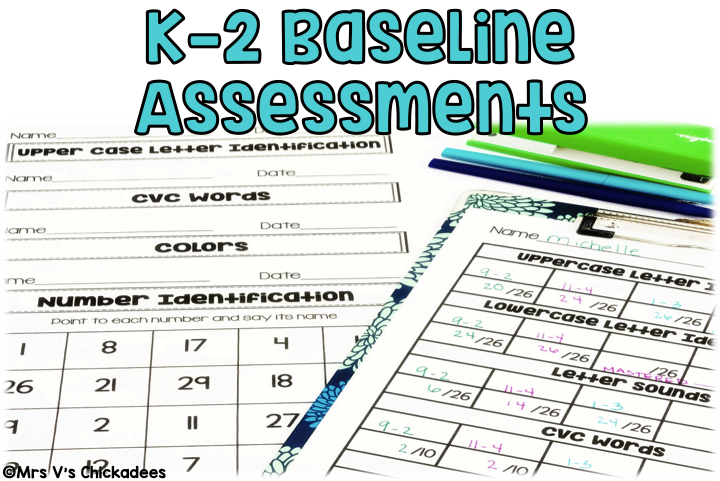 As a special education teacher, the baseline assessment has many benefits. Specifically, when it comes time to writing IEP's and updating student learning goals. You will have one sheet to refer to that will highlight areas of strength and areas that continue to need support. 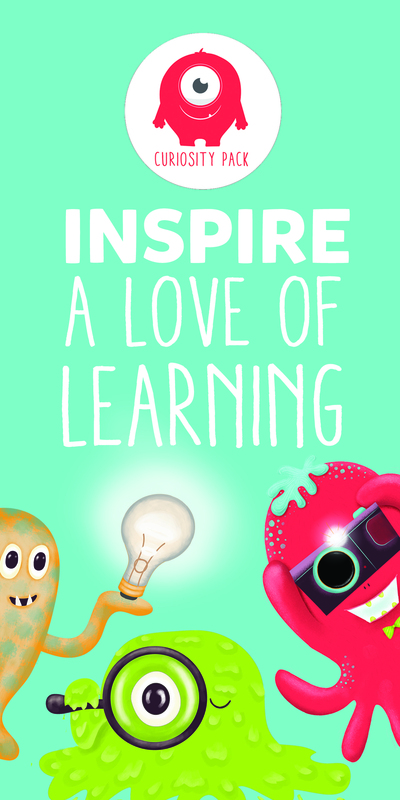 It is also a great touch point for when and where to differentiate within your lessons and classrooms. *Michelle has an okay sense of uppercase letter identification-I don't believe she will need intervention, unless no gains are made by next assessment. * Michelle has a good sense of lower case letter identification-no need to provide extra support in this area at this time. 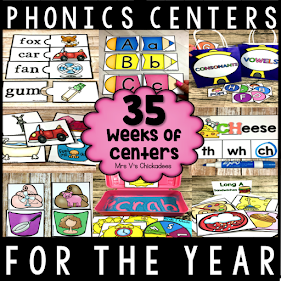 *Michelle has very little knowledge on letter sounds- Keep this in mind when you come to this unit and consider beginning classroom interventions on this skill. *Michelle has mastered letter identification-there is no need to test her on this moving forward. 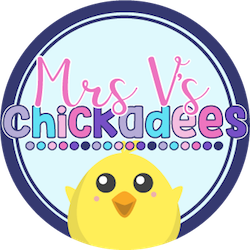 *Michelle is making slow progress with CVC words-continue to work with her on this skill. 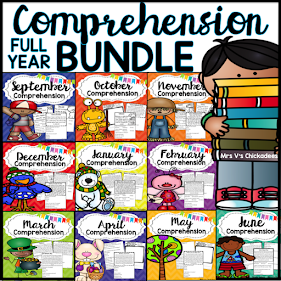 Place her in a word work group with other students who need to build their CVC skills. *Michelle has made almost no progress with syllables-time to start intervention with this subject. 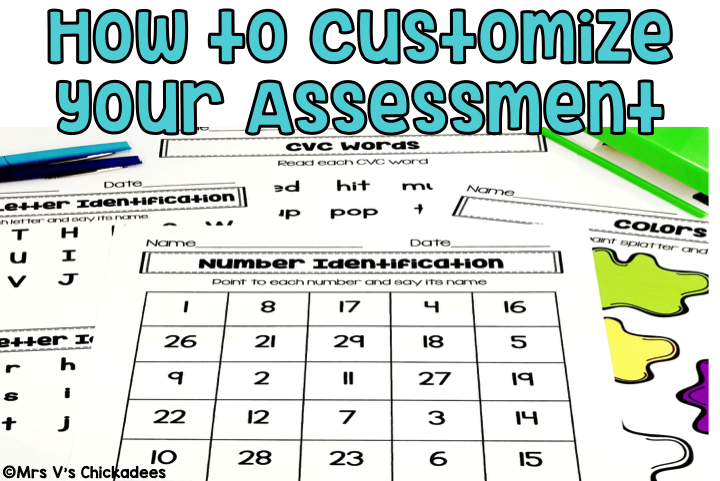 Each assessment comes with more skills than you will ever need to assess. 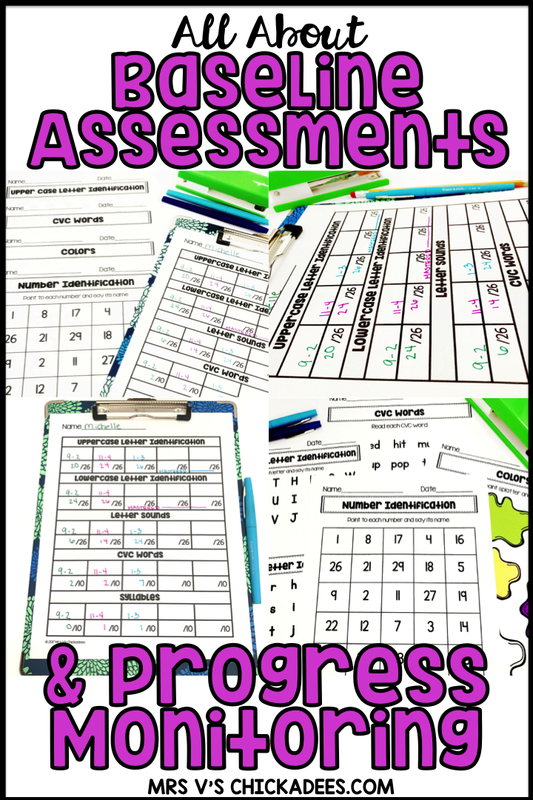 The assessment pages and tracker are customizable. Each skill is on a separate page, which allows you to print and copy ONLY the skills you want to use. Additionally, the tracker comes pre-made (for those ambitious teachers who do want to use every skill) and with an editable version. The editable version allows you to type in the skills in the order you want to assess! Do you want to come back later? Pin the image below!